They have released 3 CD's Tiptoe Trip, Waltz in the Shape of a Tree and a Christmas CD with special guests entitled Cool Yule. Their CD's have been well received and played on many radio stations at home and abroad including; CBC, RDI, Espace Musique, NPR and Lyric FM in Ireland. Marc Atkinson's compositions are punchy, driving and rhythmically inventive. 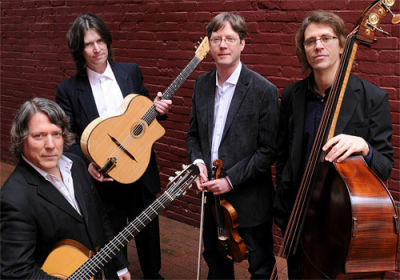 They take the guitar beyond the usual repertoire and sound. The tunes have a fiery but elegant style, infused with a catchy blend of influences. All the while maintaining the laid-back humour and casual "good time feel" of Canada's West Coast. His picking has been described as flawless, surprise-filled, sizzling and supremely melodic. His music is original, complex and challenging in its conception and delivery but remains accessible and absorbing. With Brett Marten on rhythm and Scott White on bass, along with special guest Robin Layne on percussion, the music of this fine group welcomes all listeners aboard for an intriguing, exhilarating and unforgettable ride.